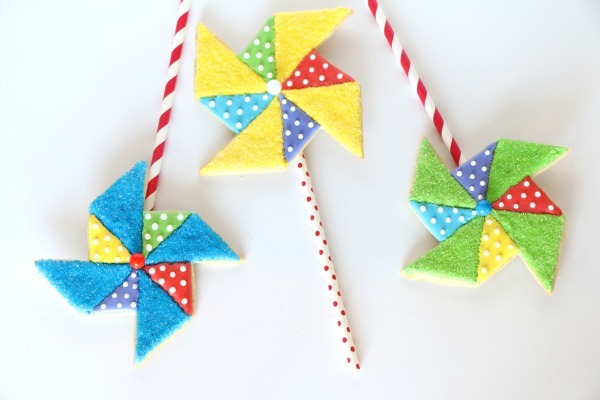 How to Make Spinning Pinwheel Cookies! 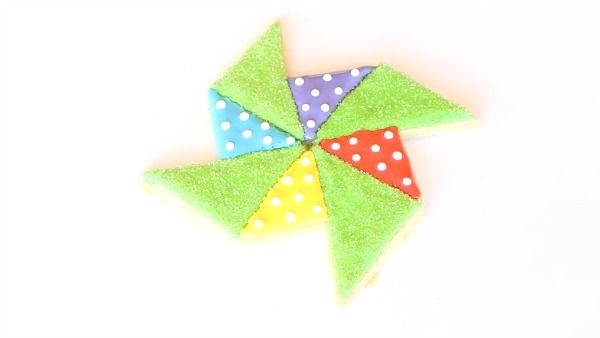 What’s better than a decorated pinwheel cookie? 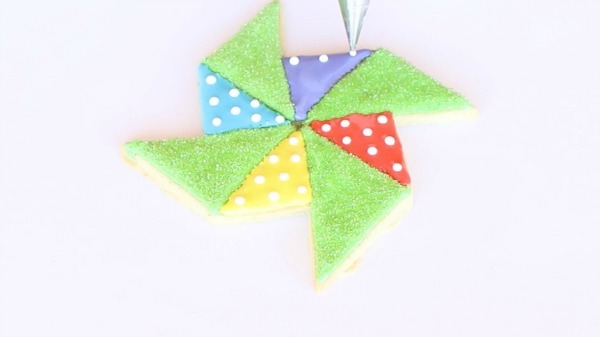 A decorated pinwheel cookie that actually spins, that’s what! I had this crazy “what if” idea the other night, and I just had to give it a try. 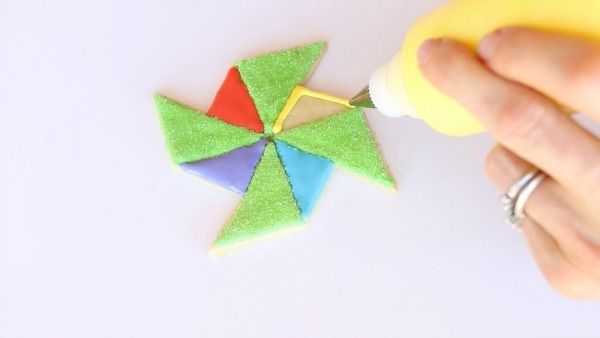 After a trip to Michael’s craft store, one to Office Max and one to Target, I felt like the MacGyver of baking, assembling potential pinwheel cookie-toys in my kitchen. Here’s how to make them: Watch the video tutorial, and then check out my step-by-step photos, below. 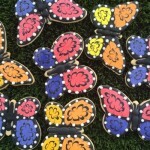 As always, I’ve used my Vanilla-Orange Sugar Cookies and Royal Icing recipes for this project. 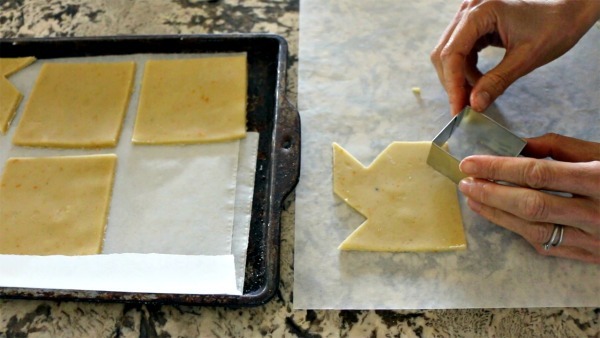 Step 1: Cut out square shapes from the sugar cookie dough. Step 2: Use a smaller square cutter to cut out triangle shapes from the end of each side of the square. The resulting shape will be the base for the pinwheel. 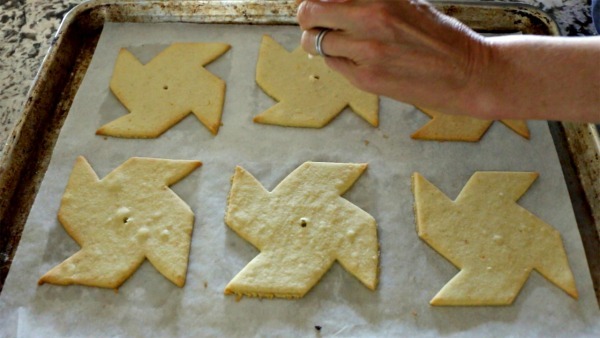 Step 3: Immediately after baking, poke small holes in the center of each pinwheel cookie (while they are still very soft.) I used about a 1/8-inch diameter hole. 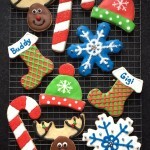 Let the cookies cool. 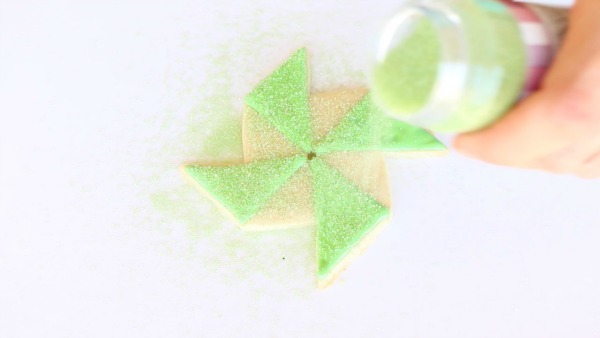 Step 4: Using green icing (or your color of choice), pipe a triangle shape as shown, to form one spoke of the pinwheel. 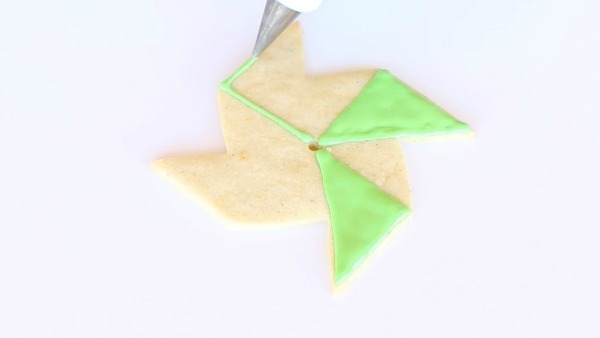 Flood the center of the triangle with green icing. 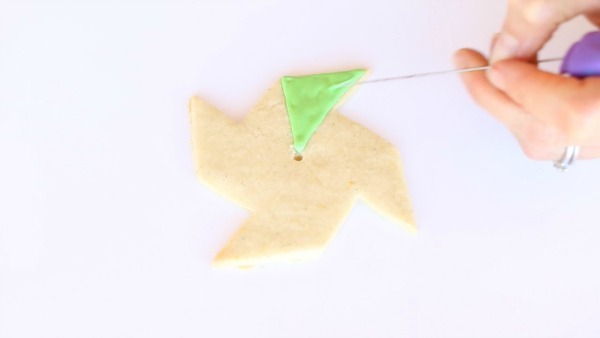 Step 5: Use a cake tester or toothpick to fill in the triangle and get rid of air bubbles. Step 6: Repeat steps 4 and 5 three more times to make the other three spokes of the pinwheel, as shown. 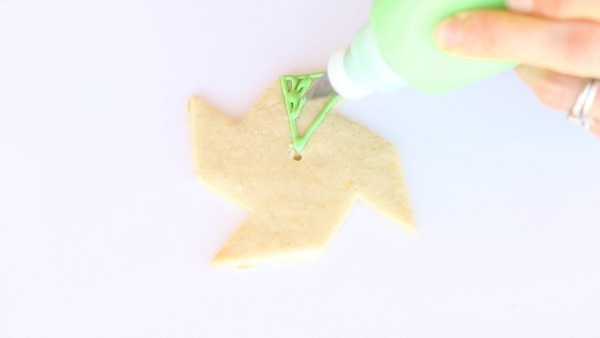 Step 7: Sprinkle green sanding sugar (or whatever color you are using) over the still wet icing, shaking off excess. Tip: I keep a small paintbrush on hand to brush off excess sanding sugar from small areas. 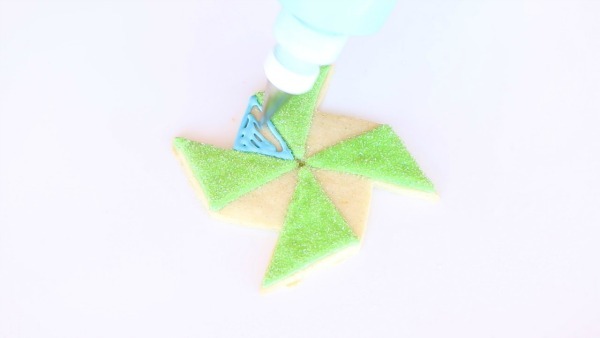 Step 8: Using blue icing (or another color), outline and fill in one of the triangle areas between the green spokes. Use a toothpick or cake tester to fill in the gaps. Steps 9-11: Use three different colors to outline and fill in the other three triangle areas. Step 12: Using white icing and a #1 tip, pipe polka dots onto the inner triangles. Step 13: Tada! Beautiful! 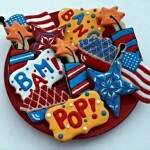 Allow the cookies to dry at least 6 hours or overnight. 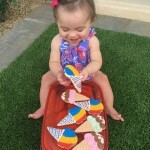 Step 14: Now, let’s assemble those pinwheels! 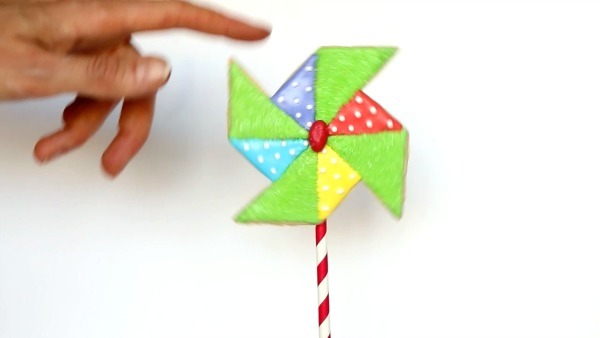 Follow the steps below to assemble the pinwheels. Make sure that you cover any sharp push pin backs with some of the soft candy. 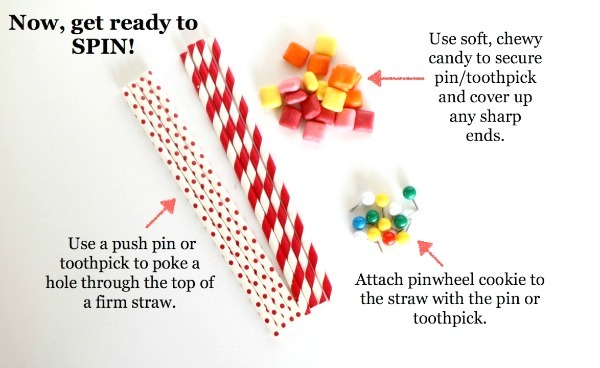 I used mini Starburst chews, which I found at Target. Step 15: Spin that pinwheel! Fun, huh? 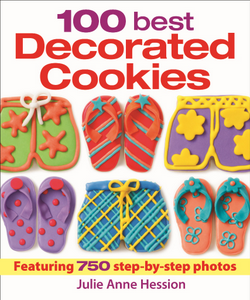 As always, let me know if you have any questions or cookie-decorating requests. I love hearing from you! Thank you so much, Diana, and thank you for sharing! They were a fun “what if” idea that turned into a project. Just received my FB University information — going to take a look asap! 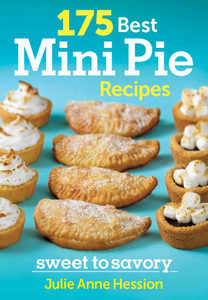 I can’t wait to make these for my granddaughters! Genius! This is adorable! I work a Farmer’s Market and after some very windy weather, we decided to have fun (rather than be bitter about toppled tents and blown-away produce!) and make Wind the theme for a week. I thought I could make these, but the pins really have me nervous with little ones. Any ideas to substitute with something edible/kid-friendly? Hi Rebecca! Thank you so much for your comment. I thought of that issue (regarding the pins), after I published this. Perhaps a toothpick that has been cut in half would work? Maybe a small paperclip would work, too. You’d have to wind it around a bit, so it would be a little more tedious, but definitely safer!